BenYishay, A., Rotberg, R., Wells, J., Lv, Z., Goodman, S., Kovacevic, L., Runfola, D. 2017. 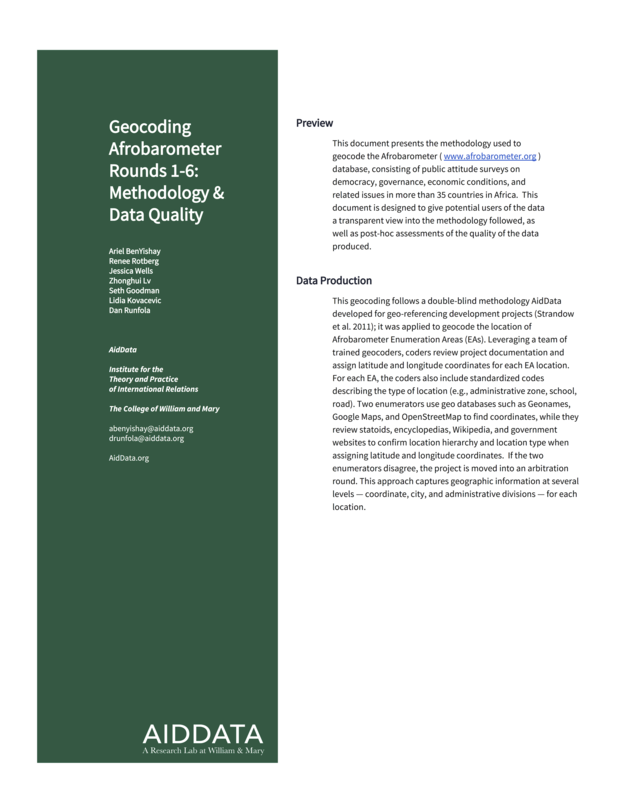 Geocoding Afrobarometer Rounds 1-6: Methodology & Data Quality. Williamsburg, VA: AidData at William & Mary. This document presents the methodology used to geocode the Afrobarometer ( www.afrobarometer.org ) database, consisting of public attitude surveys on democracy, governance, economic conditions, and related issues in more than 35 countries in Africa. This document is designed to give potential users of the data a transparent view into the methodology followed, as well as post-hoc assessments of the quality of the data produced. Funding: This work was made possible through the vital collaboration of Afrobarometer and financial support from USAID, the Hewlett Foundation, and the College of William and Mary. This work was performed in part using computational facilities at the College of William and Mary which were provided with the assistance of the National Science Foundation, the Virginia Port Authority, Virginia's Commonwealth Technology Research Fund and the Office of Naval Research.